Pre-Registration For The New Samsung Note II LTE In Singapore Now! 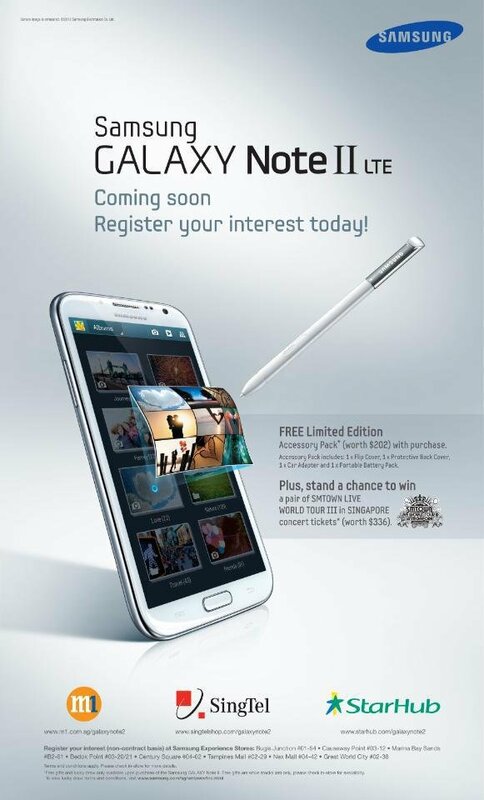 Register Your Interest For The New Samsung GALAXY Note II LTE Now! Here’s a even more exciting news for Friends and Fans Of The Samsung Note 2!! You can be among the first few to get the New Samsung Note II LTE with our 3 major Telcos in Singapore now! When you pre-register, you will get the FREE GALAXY NOTE II LTE Accessories Pack (Worth S$202) – While Stock Lasts!! Upon completion of the registration, you will receive a email or SMS from M1 or SingTel almost immediately, except for StarHub users, the confirmation email on details about the phone purchase will only be sent within one week. Check Out Samsung Singapore website for more details and location for Samsung Experience Stores.